How do apps fit into libraries? The swell folks at Auryn provided me with app codes to give to librarians to test. (I still have one left, email me!) Thank you to Katie Bruce for our first review. I hope it helps and please join in on this important conversation that will only continue to become more significant to our profession. 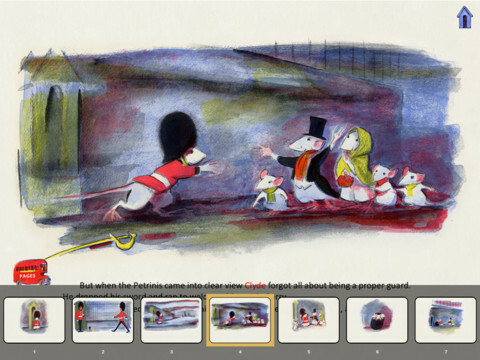 Don Freeman’s picture book, “The Guard Mouse,” is brought back to colorful life in this enhanced book app. Originally published in 1967, this long out of print book tells the story of Clyde, a mouse guard at Buckingham Palace, who takes his visiting American cousins on a tour of the most famous landmarks in London. Don Freeman’s original watercolor illustrations have been beautifully digitized and match up with the print version exactly (yes, I traveled into my library’s storage facility to dig out our one copy of the original to compare). From the home page, users are offered three different ways to read this story. They can choose an auto play feature where a narrator reads the words and the pages turn automatically, they can choose the “Read To Me” feature, which is similar to the auto play, except the reader is in control of when the pages turn, or they can choose “Read Myself” which offers no narration. With both narrated versions, the words are highlighted as they are read. In all three versions users can tap items in the illustrations to trigger labels to appear, such as “fence” or “Big Ben”—quite a useful feature for emergent readers. There is no icon or button for page-turning. Swiping the screen turns pages—a motion which only experienced iPad users may be familiar. A home button, shaped like a little blue sentry box, appears in the top right corner of each screen and will take users back to the main page. A small, red double-decker bus also appears on the bottom left of each screen; touching it pulls up a scroll of all the pages, allowing readers to skip ahead in the story. Perhaps the most exciting aspect of this app, however, is the option for users to customize the story. The Personalize tab on the main page gives users the option to edit the book. They can record their own narration and even write and record their own version of the text. Parents who have to be absent at bedtime could still “read” their child a story with this feature. There are also possibilities for using this app to teach visual literacy skills. Children could make-up and record their own story from looking at the pictures. Although fairly easy to figure out, with reset and edit buttons and record and play icons, the Personalize feature would likely require adult assistance and could be a fun classroom or parent-child interactive activity. A beautifully done picture book app that will certainly create some new Don Freeman fans. As a librarian, the potential to better serve patrons who come in seeking older, out of print picture books is also evident with this app. Auryn, Inc. offers a large library of picture books apps, including “Tilly Witch” by Don Freeman—a title I recently had to Inter-Library Loan for a patron because we did not own a copy. The possibility of searching for a digitized version of that book had not occurred to me, but it is certainly something I will now consider. Recommended for ages 4 & up. Katie Bruce is the Children’s Librarian at Cape May County Library. She has her MLIS from the University of Illinois. She is too humble to let you know what a dedicated and creative librarian she is. She also has flawless taste in literature. Thoughts of a Librarian about “The Guard Mouse” app by Auryn. Must read! !